As you dive into the vast world of cocktails, things can be overwhelming and there is a lot of advice out there that can make it worse. Amid the many questions you may have, there are a few universal misconceptions that can add to the confusion. For instance, do you simply have bad taste if you don't enjoy an iconic drink like the martini? Should your best liquor be banned from mixed drinks? Are all cocktails difficult and what is the most important ingredient in the bar? Let's look at five common myths that you don't have to worry about anymore so you can mix up a drink and simply sit back and enjoy it! This is the biggest misconception in the cocktail world. While there are many drinks that are somewhat difficult, the majority are very easy to create. The best examples are the margarita and the daiquiri. These two drinks (as they were originally designed) have been mystified in a cloud of difficulty. Much of this has to do with the over-marketed and often too sweet ready-to-drink versions found in every liquor store that claim a great cocktail is just a matter of opening the bottle. Yet, if you break these cocktails down, you will find that they're incredibly simple: Both require just three ingredients and from there it is as simple as pour, shake, and strain. Done! A fresh, superior drink is in your glass using your preferred spirits and customized to suit your personal taste. 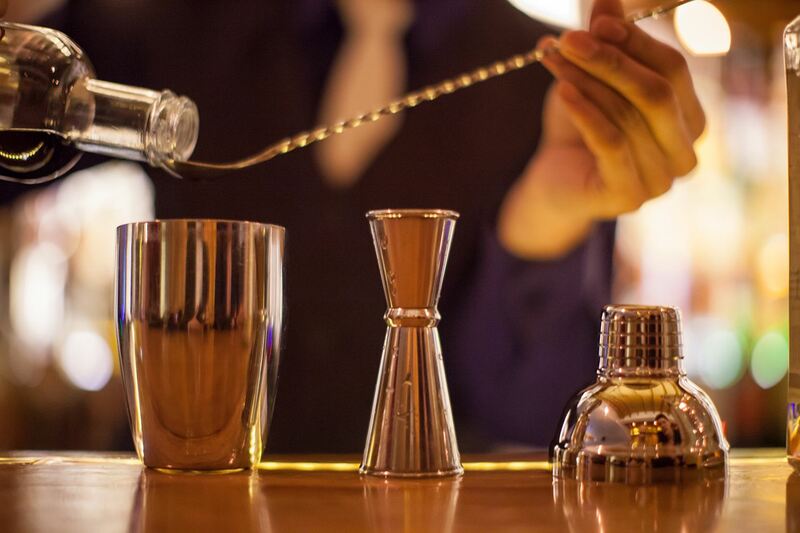 Once you have the basic bar tools (even just a good cocktail shaker) and the ability to shake, stir, and strain (all very easy tasks), the world of cocktails opens up. You will find that mixing your own drinks is not only quick and easy, but fun and worth the little effort required. Do you enjoy all the food you eat? Every beer or wine you open? Probably not. Nothing says that you have to enjoy every cocktail either, even if it is supposed to be the "best ever." Everyone has different tastes and some prefer certain flavors or styles of drinks over others. Some drinkers are very picky, while others are open to anything that comes their way. And yet, just because you are willing to try something, it doesn't mean that every drink is going to be to our liking. Also, there are many cocktails that are considered "great"—the martini, for one—but that doesn't mean that everyone is going to love them. In fact, everyone who has tried one probably has an opinion about the martini—whether it's worth all the hype or not and, if it is, how to make it. Taste is subjective and that is the number one rule in the drink world. If you like it, drink it! If you don't, then it's time to move on. There are plenty of cocktail recipes out there, so keep trying. There is nothing wrong with pouring top-shelf spirits into a cocktail. In fact, it's highly recommended! Remember that many cocktails rely heavily on the base spirit and that is going to determine the quality of the entire drink. Therefore, it only makes sense to use brandy, gin, rum, tequila, vodka, or whiskey that you really enjoy. These are the foundations of your drink and there is no reason to degrade the entire thing right from the start. Cost is the biggest factor in this myth. Many drinkers simply do not want to use their $40 bottle of vodka for a cosmopolitan. They may enjoy their $60 bourbon straight and feel it is a waste to mix it, even in something as congenial as a Manhattan. However, if you think about it, you're actually doubling the value of that pour of liquor because you are adding volume via the other ingredients. This prolongs your enjoyment and enhances the overall experience of your favorite spirits. On the other hand, that $10 liter of vodka may be great cost savings up front, but your drinks will suffer as well. If your decision is based solely on cost, drink less of the good stuff (your body will thank you in the end). Sure, keep the really high-end stuff for straight sipping, but don't let its dollar value be the only factor that keeps you from enjoying it in a cocktail. If you have it and you like it, mix it! The most used ingredient in the bar is...? Ice! Think about it, unless you are mixing a hot drink, almost every glass you fill from your bar requires ice. Ice not only chills your drinks, but it also adds dilution which brings the drink into balance by softening the spirits and marrying the flavors. In blended cocktails, it is even more essential because it becomes the drink. Does that mean that you need to go out and pay top dollar for some "artisanal" ice? Not at all! You can improve your own ice with a couple of simple steps: Fill trays with distilled water rather than tap and toss ice that has been in the freezer for a week or more. At the bar, you have no control over the quality of the ice. The good news is that many bars and restaurants realize that ice quality does matter and have taken steps to improve the ice they serve. While on the subject of under-rated ingredients, let's talk about soda. It only makes sense that if every other element in your drink is top-shelf, your soda should follow suit. Today's soda industry is huge and there are a lot of choices available to consumers. However, all soda is not the same and some create superior drinks. Case in point, the simple gin and tonic... It is an easy drink and difficult to screw up. You have a great gin—say Tanqueray No. 10—and some nice, clear ice in your glass. Which tonic will you choose? A mass-produced, artificially flavored and sweetened tonic? Or would you prefer a hand-crafted, perfectly balanced tonic water designed to enhance that gin? There is a big difference and you can taste it for yourself by comparing the two choices in the same drink recipe. If you enjoy simple highballs—including the Rum & Coke or Moscow mule—try to explore the lesser-known soda brands, particularly those that were created for cocktails like Fever-Tree and Q Drinks. Finally, make sure your soda is fresh! The quickest way to ruin a tall, refreshing mixed drink is with flat soda. If you don't use a particular style often enough to constitute buying large bottles of a particular soda, look for smaller options to ensure every drink has a brilliant sparkle.